Exporter of a wide range of products which include excavator filters for earth moving machinery. Bharani is considered to be the trusted manufacturer and trader of Excavator Filters for Earth Moving Machinery. Manufactured in adherence to the predefined industry standards, these filters are widely demanded in the industry due to their smooth functioning and robust construction. These filters are tested for their quality and flawlessness, before the final dispatch. 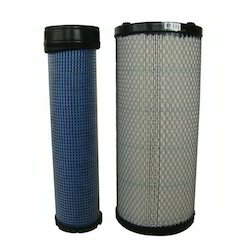 Looking for Excavator Filters for Earth Moving Machinery ?